The Rheem Performance Line. Exclusive to the Home Depot! A 39 gallon electric water heater providing an ample supply of water to households with 2-4 people. This model has a 6 year limited tank and parts warranty plus a 1 year in home labour warranty. A patented magnesium anode rod design incorporates a special resistor that protects the tanks from corrosion, providing longer tank life. This unit comes with two 3000 watt elements and an automatic thermostat which keeps the water at the desired temperature, providing fast hot water delivery. Requires 240 volt electricity (a 20 amp breaker, with 12 gauge wire from the panel). Want better warranty, power, and easy to operate diagnostic controls? Trade up to Rheem Performance Plus (SKU # 1000792899). The Rheem Medium Duty Propane water heaters short heights and small jacket diameters result in greater installation flexibility and makes this unit ideal for easy replacements. Typical applications include large residences, small restaurants, apartments up to 4 units and small office buildings. 180 maximum operating temperatures. Factory installed CSA/ASME temperature and pressure relief valve reduces installation time. This Rheem EcoSense 2" PVC Tankless Water Heater Horizontal Vent Termination Kit flush mounts to your outside wall for an aesthetically pleasing appearance. Made to fit your high-efficiency Rheem EcoSense condensing indoor gas tankless water heater. Works with PVC and ABS piping. One year limited warranty. Performance 39 Imperial Gal Electric Water Heater with 6 Year Warranty The Rheem Performance Line. Exclusive to the Home Depot! A 39 gallon electric water heater providing an ample supply of water to households with 2-4 people. This model has a 6 year limited tank and parts warranty plus a 1 year in home labour warranty. A patented magnesium anode rod design incorporates a special resistor that protects the tanks from corrosion, providing longer tank life. This unit comes with two 3000 watt elements and an automatic thermostat which keeps the water at the desired temperature, providing fast hot water delivery. Requires 240 volt electricity (a 20 amp breaker, with 12 gauge wire from the panel). Want better warranty, power, and easy to operate diagnostic controls? Trade up to Rheem Performance Plus (SKU # 1000792899). Performance 39 Imperial Gal Electric Water Heater with 6 Year Warranty is rated 1.0 out of 5 by 1. Rated 1 out of 5 by Karlca from Dead after 2 week of usage Do not buy (terrible product) with even worse customers service. In reply to TheRheemExpert the model number on the new tank is XE40M06ST30C0,not sure if these are all 0's or O's and the serial number is Q491840668. I got no paperwork with this replacement tank and wonder if this one will get to the warranty. Doubt it. Hi Fergie. The comparable model would be Model XE40M06T30B0, Home Depot Article 1000792906, and manufacture number 630021. Hope this helps. Cheers. I just got a replacement water heater for the last one I bought because it didn't make it to half of the warranty time of 6 years. The model # on the new tank does not match any of these tanks on this site. How do I now which one I have? The model number on the tank is XE40M06ST30C0 (not sure if these are 0's or O's) Serial number is Q491840668. Hello, how much insulation is in this tank? Overview Model # 630076 Store SKU # 1000792788 says it is 30 gallon but is in reality 23 imp gal and 105 liters. What is the actual imp gal size of this tank and why is Overview Model # 630076 Store SKU # 1000792788 labeled as 30 us gal in Canada? In regards to my last question, how does the self cleaning system work to remove sediment? &nbsp;Thanks. Hi CamM Rheem has an exclusive dip tube (how the water enters the water heater) which is rifled at the bottom. This swirls the water keeping sediment suspended so it does not collect and attack the sides of the tank, prolonging its life. Hope this helps. Cheers. Mike. How are these water heaters insulated? &nbsp;Foam? &nbsp;There are only two of us in the house, and we are on a well. &nbsp;Would it be better to upgrade to the more expensive 39G unit, or downgrade to the less expensive 39G unit. &nbsp;What are the pros and cons? Hi CamM. Thanks for reaching out. These units are insulated using a liquid, foam to floor insulation that then hardens, filling every nook and cranny between the interior tank and exterior jacket. 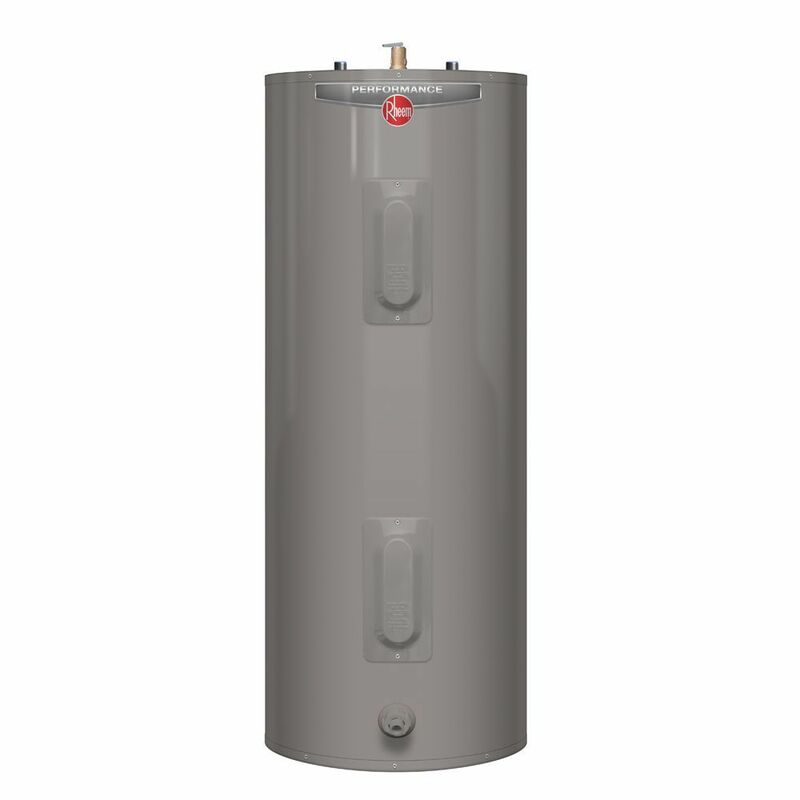 The Performance levels are as follows: Rheem Opening Price Point (Home Depot article 1000792307)-a standard water heater that meets NRCAN and CSA requirements. Basic warranty of 6 years on the tank due to manufacturing related leaks, 1 year on parts if the water heater stops working, no labour. Rheem Performance (Home Depot article 1000792906) -improved warranty with 6 years on tank, 6 years on parts, 1 year in house labour (might be a good consideration if on a well with hard water). Rheem Performance Plus (1000792899) -Includes: Self Cleaning system that removes sediment prolonging the life of the tank (might be a good consideration if on a well with hard water). A self diagnostic control to help trouble shoot challenges. More powerful elements for faster hot water recovery (might be a good consideration if on a well with cold water). Better warranty with 9 years on the tank, 9 years on the parts, and 1 year labour (might be a good consideration if on a well with hard water). Rheem Performance Platinum (1000839811)- -Includes: A digital self diagnostic control to help trouble shoot challenges. More powerful elements for faster hot water recovery (might be a good consideration if on a well with cold water). Better warranty with 12 years on the tank, 12 years on the parts, and 1 year labour (might be a good consideration if on a well with hard water). Higher efficiency rating (might be a consideration if your looking to keep costs down). Hope this helps. Cheers. I have a Rheem electric hot water tank that is 4 years old. We do not get hot water out of it at all, only warm. The plumber has check the elements are reports they are good,and there is 240 volts going the the unit. What could the problem be? Hi Greg. Thanks for reaching out. Based on the information provided, I can come up with two possible challenges. One might be a problem with the thermostatic mixing valve (assuming that this is code in your area, and that you have one installed). It could be clogged with calcium build up. The other one I could think of is the thermostat might be turned down. You may want to check this. I would also suggest that you call the Rheem tech line at 800 268 6966, and they might be able to trouble shoot the challenge with you. I hope this helps. Cheers.